When you reach for a snack, how much thought do you give to your dental health? First Impressions recommends planning snack times to include more foods that won’t cause cavities and fewer foods that cause cavities easily. Read on to help navigate tooth-friendly snacking! First and foremost, water is the beverage of choice. Children should sip on water after every meal or snack. This helps to rinse away the sugars from foods so that they aren’t on teeth. Also try to avoid sticky foods, and foods that are high in sugars and/or carbohydrates. So what are the BEST foods for kids to snack on? Some great snack-time choices are raw, crunchy veggies (such as broccoli and carrots); cheese; and nut butters — like peanut butter on celery sticks. These foods generally do not cause cavities. (There are always exceptions, especially conditions like dry mouth, acid reflux, and genetic abnormalities). 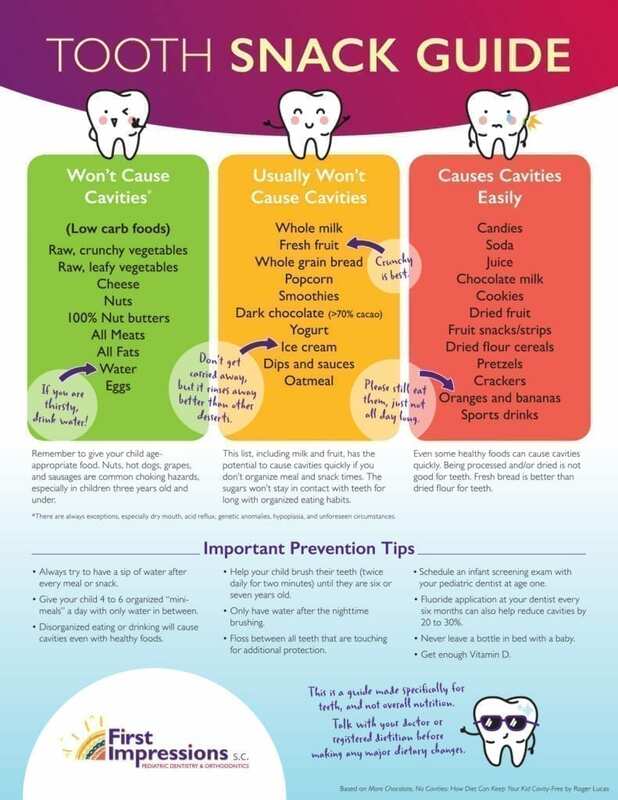 The following foods have the potential to cause cavities if meal and snack times are not organized (the sugars won’t stay in contact with teeth for long with organized eating habits): whole milk, fresh fruit (crunchy is best), yogurt, and dark chocolate. Many of these can even satisfy a sweet tooth without causing too much harm. Just as adults, children should brush twice daily for two minutes. Parents should help them brush until they are about 6 years old. And as soon as children have teeth that touch, they should floss as well. Schedule an infant screening exam with your pediatric dentist by age one.